Creates a new instance of Spot light with default parameters. 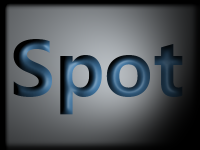 Creates a new instance of Spot light with the specified x, y, z, specularExponent, and color. Gets the value of the property pointsAtX. Gets the value of the property pointsAtY. Gets the value of the property pointsAtZ. Sets the value of the property pointsAtX. Sets the value of the property pointsAtY. Sets the value of the property pointsAtZ.